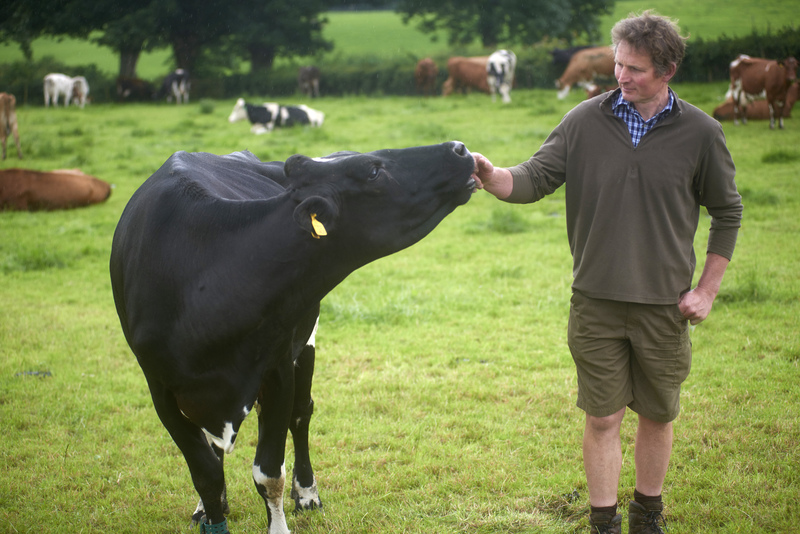 341 acres in total, Low Sizergh Farm near Kendal is home to a cross bred dairy herd of Holsteins, Swedish Reds and Montbeliardes – as well as pastured hens and Mule sheep. This is where farmer Richard Park produces over 1 million litres of milk each year. He explains why the real value of food, and its cost, is summed up by the words ‘local and organic’. And why he sees this market as the best way to connect with his consumers. The phrase ‘local and organic’ often feels fashionable and overused. But I believe it to be the real story of how food should be produced, bought and enjoyed. This doesn’t sit well with the food industry’s recent focus on volume and price over quality or sustainability. That focus has masked the true cost of food production. A recent report from the Sustainable Food trust, ‘The Hidden Cost of UK Food’, suggests that for every £1 spent on food in the shops, consumers incur an extra £1 in concealed costs. They include the now-known impacts of intensive production methods – from environmental pollution and soil degradation to loss of biodiversity, plus import costs and the impact of poor diets. Consumers and farmers can and should work together to find alternatives. The organic market is a front runner – providing reassurance that the food has been farmed and retailed to a verified standard. It also addresses consumer concerns about the conditions in which farm animals are reared, the environmental impacts of food production, and the effect on public health. Animal welfare is at the heart of the organic system. On our farm, the cows graze on species-rich grass and there’s plenty of proof that they can play a huge role in improving both the land and our diets. Last year, I trained in Holistic Farm Management. By changing my approach to grazing and herd management, I can encourage and maintain a diverse plant population and have a healthy, biologically active soil that provides nutrients for plants, the animals that feed on them, and the people enjoying the food those animals produce. I first converted to organic farming and milk production in 2002. By 2010, the organic milk market was oversupplied and the price per litre was similar to conventional milk. This price didn’t take account of the additional cost of producing organic milk so we moved away from organic. So what’s different in 2018? There’s a growing market and a healthy Organic Milk Supply Cooperative (OMSCO) to work with. There’s growing consumer pressure for good food, produced well, and with no cost to the environment. Also, we were experimenting with not using fertilisers on some fields. I was impressed by the improvements in sward diversity, as clover and herbs appeared. Coupled with my new knowledge about soil, it seems several complementary and transformative principles have led to a timely organic reconversion on our farm. It will take two years for us to become properly certified as an organic milk producer. We will sell our first pint of organic milk on the 1 st September 2019, which will also include organic raw milk. In the meantime, we’ll continue to offer raw milk from a vending machine just yards from our milking parlour. It’s a very visual reminder of what’s important to us and will soon celebrate the ‘local and organic’ story of real food laid bare. Local and organic produce connects people to those of us employed in the production of their food, the welfare of the animals and the natural environment. All whilst providing a viable, sustainable living for farmers.